"Sets automatically via radio signal to the nearest atomic clock for the ultimate in accuracy." "A good wall clock doesn’t have to be expensive and can be just as good at keeping you on time as a fancier clock." "This retro diner-inspired wall clock certainly has a sense of fun!" "This clock has a solid oak case, a gold-tone pendulum and Roman numerals to complete the elegant effect." "Its Roman numerals ... appear more like design elements than time-keeping numbers." "A clock that complements your fixtures." "Complement modern decor without looking fussy or out of place." A good clock for most rooms has a classic design that will work seamlessly with different types of decor. A round clock face is the traditional choice, and one with a white or cream background provides the best contrast with the numerals, making it easy to read from a distance or at an angle. A simple, classic frame around the face helps the clock work in any room, anytime. The La Crosse Atomic Wall Clock is praised for its clear, simple styling and elegant numerals. The design along the edges helps you count down to the minute. As an atomic clock, it sets automatically via radio signal to the nearest atomic clock for the ultimate in accuracy. It even adjusts automatically for daylight savings time — so no missing work because you accidentally slept in! A good wall clock doesn’t have to be expensive and can be just as good at keeping you on time as a fancier clock. An inexpensive clock may be made of less expensive materials, with a plastic or paperboard face and framing done in metal or plastic, and it may not have the automatic settings that a pricier clock would. But this under-$10 clock is an Amazon bestseller for a reason: The style is classic and inoffensive and the numbers are clear and good-looking, with the dots along the edges to tell more precise time. At 10-inches in diameter, it’s a little smaller than some other options, but this can be an advantage for smaller spaces. Calendar reminders and phone alerts are fine, but sometimes a good, old-fashioned wall clock is the best way to keep meetings on track and count down the minutes until lunch! A wall clock for your office should have a clean, businesslike feel. You don’t want it to be too big, but you do want it to be large enough that you can quickly glance at it from across the room. A high-contrast white background and black letters also make it easy to read. Plus, you might not want anything too zany to compete with your professional persona. This handsome wall clock by Latitude Run has a design-forward font and sleek metal frame for a look that’s hip and professional, too. The kitchen is a room where many homeowners like to have a little more fun and choose playful, friendly decorations. So it goes with wall clocks, where you might go with a clock in an unusual color, or with decorative motifs or in an unexpected shape that can show off your personality. This retro diner-inspired wall clock certainly has a sense of fun! The numerals are done in a quirky font, and orange metal frame will brighten any kitchen. For the dining room, look for a clock that fits in with your decor and has a more formal feel than clocks in other rooms of the house. Often, that means finding a clock with a pendulum, or one with a frame made out of wood with carved details that will go well with the furniture or moldings in your dining room. You also might prefer a clock that blends in with the decor so that your dinner guests won’t feel like they’re “on the clock” but allows you to mind the minutes if you’re waiting for a meal to finish in the oven. This clock has a solid oak case, a gold-tone pendulum and Roman numerals to complete the elegant effect. In a living room, you don’t want your clock just to tell time — it should be part of the decor, as well! So in this room, it’s good to go BIG with clocks and get a statement piece on a large scale that will take the place of artwork over a mantel or sofa. A clock with an open face that shows the wall behind makes a bold statement without seeming too bulky. Other notable features of this oversize clock are its Roman numerals, which appear more like design elements than time-keeping numbers. This super-popular clock has more than 1,200 positive reviews on Wayfair and is praised for fitting perfectly into a variety of spaces. When you’re getting ready in the morning, a wall clock can be an essential tool for getting you to work on time! Having a clock that looks nice in your bathroom — and that you can read at a glance — will help you move along without having to check your phone while you shower or shave. Here, look for a clock that complements your fixtures, cabinet hardware and other decorative details in the room. If you have metallic accents throughout, this clock in a stainless steel, black or copper finish could be just the right fit. The clock is medium-sized, with bright-red hands to make it easy to tell the time. While you may be accustomed to having a clock in your home, more traditional clock styles can look out of place in a modern apartment, condo or loft-style space. So look for a clock with minimal, unexpected details, like a single-tone face and long, thin hands to tell the time. 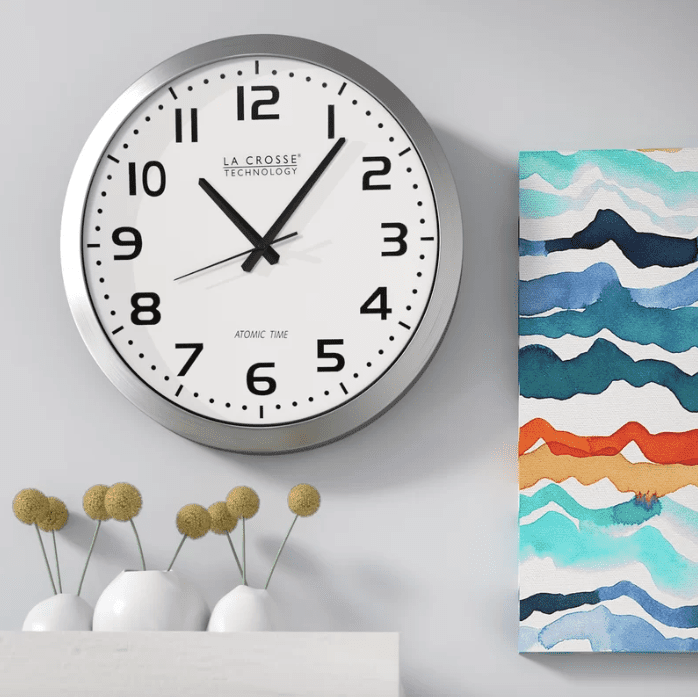 While this white-on-white clock may be harder to read than traditional clocks, it will complement modern decor without looking fussy or out of place. At The Spruce, our Expert writers are committed to researching and writing thoughtful and editorially independent reviews of the best products for your life and your family. If you like what we do, you can support us through our chosen links, which earn us a commission. Learn more about our review process.